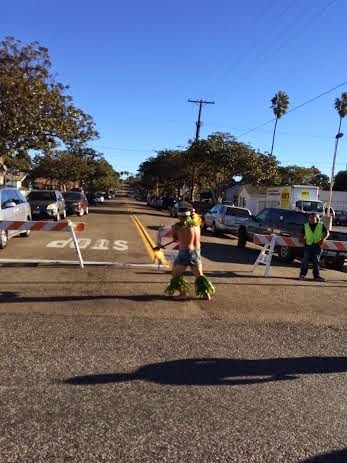 I left off yesterday with the finish of the Oceanside Turkey Trot 5-Miler. 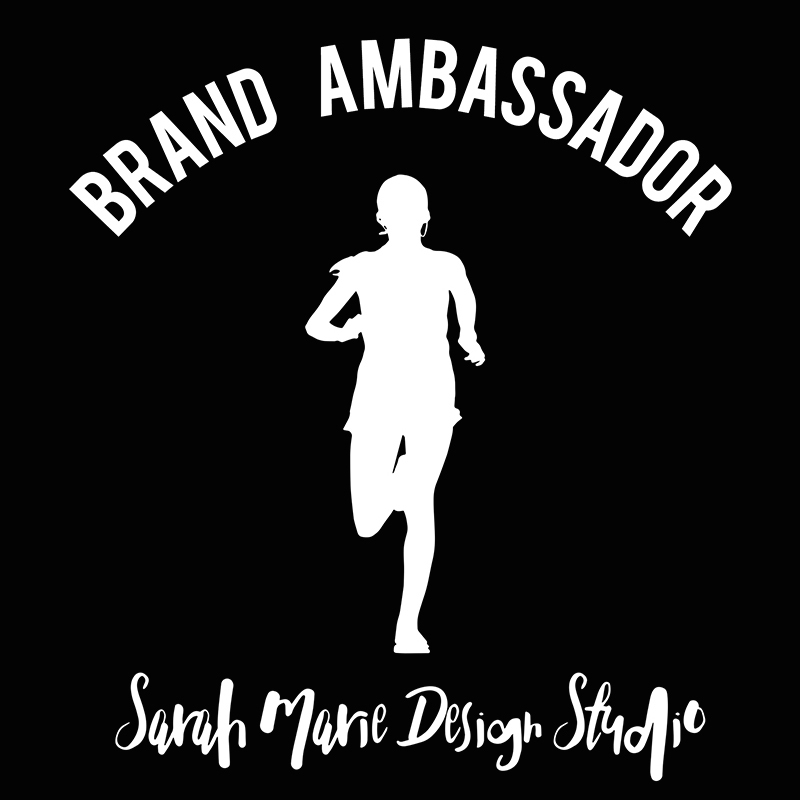 The race organizers made the starting times for the two races far enough apart so if you wanted, you would be able to COMBO and run both the 5-Miler and the 5K, which is exactly what I did. 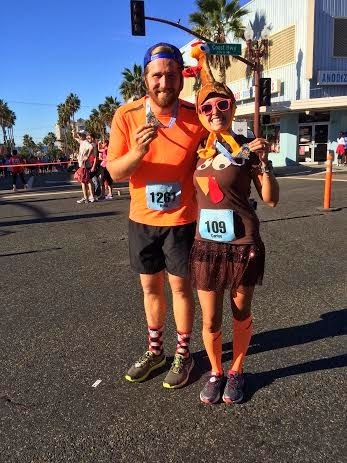 After grabbing my medal and goodies, Ryan and I headed back to the car for a quick costume change (he was playing my professional photographer during the 5-Miler, so he also had to change into his running gear). 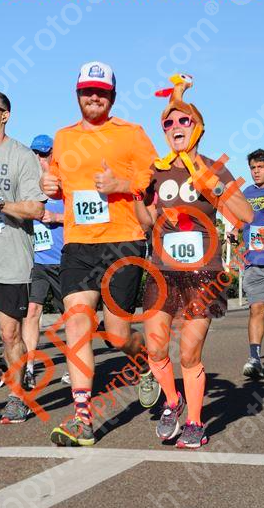 Since the 5K would be more of a "trot" compared to the 5-Miler (meaning I wasn't doing it for time and was planning on just having fun with the hubby), I knew my costume could be a little crazier... 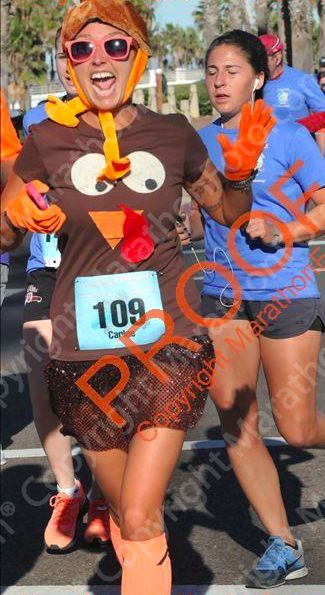 When I saw the TURKEY HATS at Target a couple months back I KNEW it had to be part of my outfit. 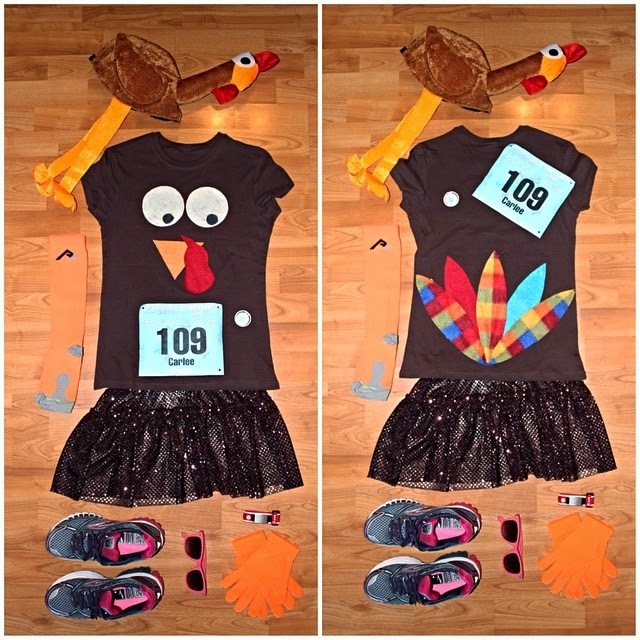 Racing Outfit includes: Brooks Ghost 6, PRO Compression Marathon Socks (neon orange), Sparkle Athletic Skirt (brown), Target Turkey Hat, Garmin Forerunner 110, Road ID Wrist ID Sport (red), Hunter Orange Gloves (from the Dollar Store), and Target Sunnies (pink). Also, timing chip for my shoe. With the 5-Miler starting at 7:00am and the 5K starting at 8:20am, we had about 40 minutes to get from the finish line to the car, change, take a couple quick pictures, and get back to the starting line - perfect! 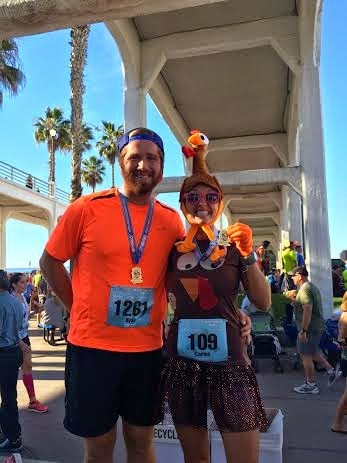 This turkey was ready to trot! 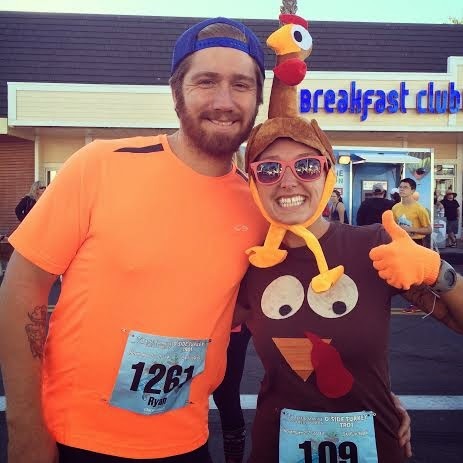 as to not let it ruin the 5K with the hubby! The temperatures were QUICKLY rising. 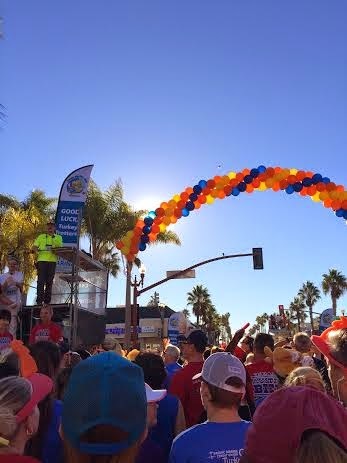 Although it was in the 40s when the 5-Miler started, it was already in the 60s by the time the 5K got under way. I kept on my gloves, mostly because I thought they went with my outfit (it is all about the fashion and my costume, #AmIRightOrAmIRight?! 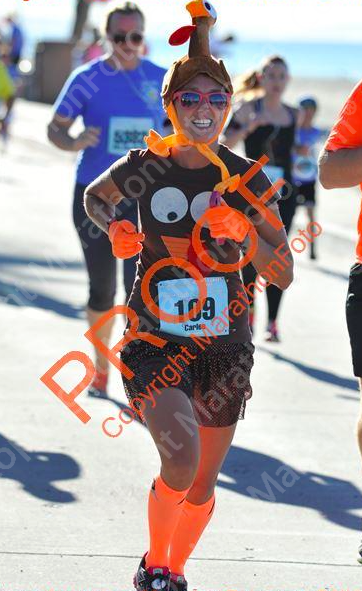 ), but by mid-race I knew the hat and gloves may have been a bad idea. on the course - pretty fun to see! Ryan hadn't run since the Avengers Half last month because he was in Hawaii for working art directing a photo shoot. We decided to take the run nice and easy (I may have even been texting with Pavement Runner a bit while trotting along during the race). 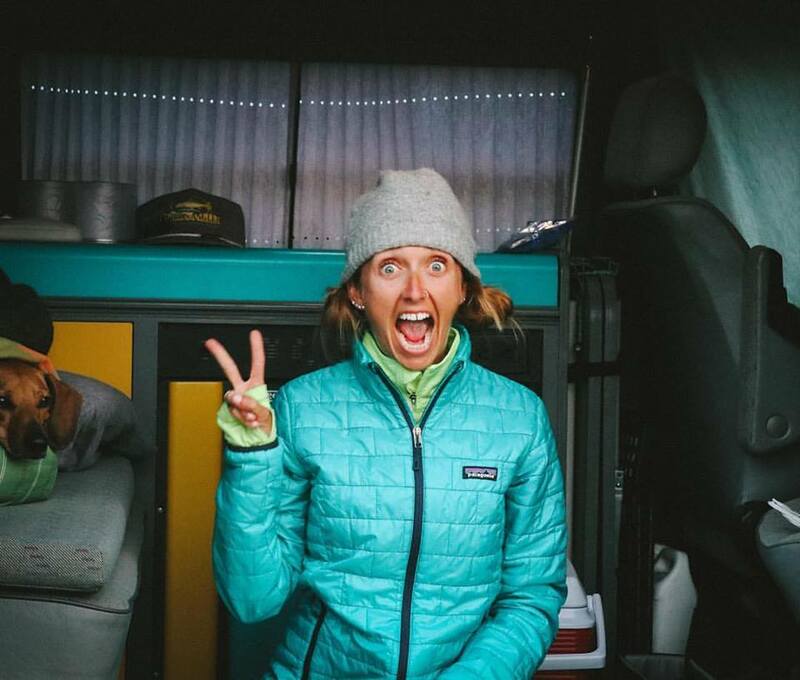 We said we would try to shoot to be around 30 minutes, but I knew 10 minute miles was normally Ryan's race pace and we may need to dial it back a little. about 2 miles into the race. We were keeping great time - around 9:45-10:00 minute mile pace for the first two miles. Ryan knew we were getting towards the end and I asked him if he wanted to speed up a bit. He nodded so we started kicking it in a little faster. Once we hit the Strand we knew we had less than a half mile left and gave it a little extra gusto. 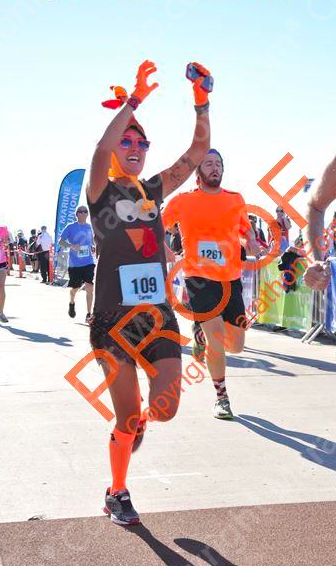 The photographer yelled "HEY TURKEY LADY"
Trotting in to the finish line! Our official finish time was at 28:47, which averages to 9:15 per mile - not too shabby (my watch even had us around 6:10 mile pace for the last tenth of a mile). 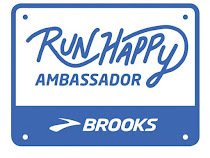 That was good enough for us to finish in the top 1075 runners out of 6044 finishers! We grabbed a couple pictures, some yummy goodies (the apples were DELICIOUS! ), and made our way back to the car. Under the pier after we finished the 5K. take a quick picture of us. Made sure to hold my medal for THIS shot! HAHAHA! 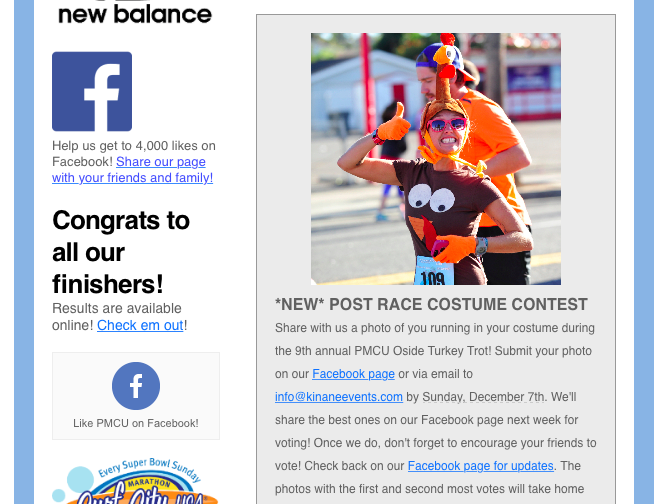 And just before I was getting ready to post this I got an email from the Oceanside Turkey Trot about taking a survey and a Post Race Costume Contest... AND GUESS WHO'S PICTURE THEY USED IN THE EMAIL?! Ummmmm.... I THINK I KNOW HER!! Do you make it a habit to move your feet before you eat? 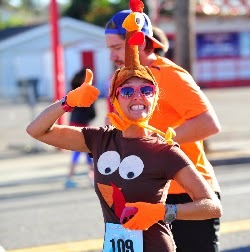 What a great Turkey trot outfit. Great job to the both of you! 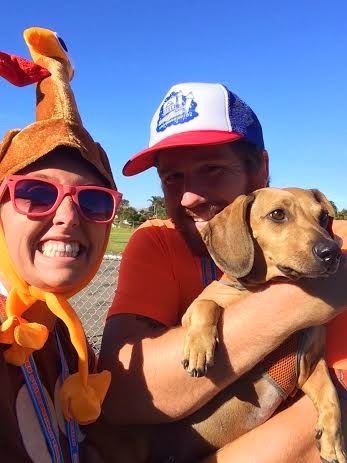 I really love turkey trots. 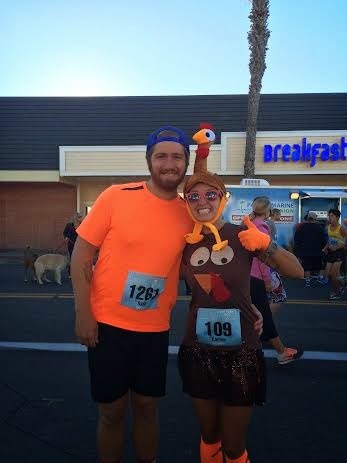 This year was my 3rd year in a row doing the local turkey trot 5k. 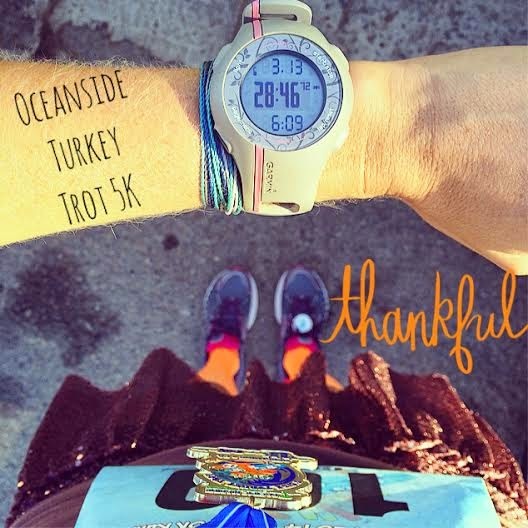 It feels good to get in a good run before indulging in #allthefood.